Complete our online survey: https://climbyukon.typeform.com/to/M9g92l. Thank you for supporting this project! Fifteen athletes from Whitehorse participated at the Annual Juneau Indoor Climbing competition at the Rock Dump Indoor wall. There was about 50 participants to the event, with 13 youths from the Yukon Youth climbing team as well as 2 adults participating. There was only one open category. The competition was tough for the youth. There was at least 50 boulder problems set-up by the gym from V0 to possibly V7 being some of the hardest problems. 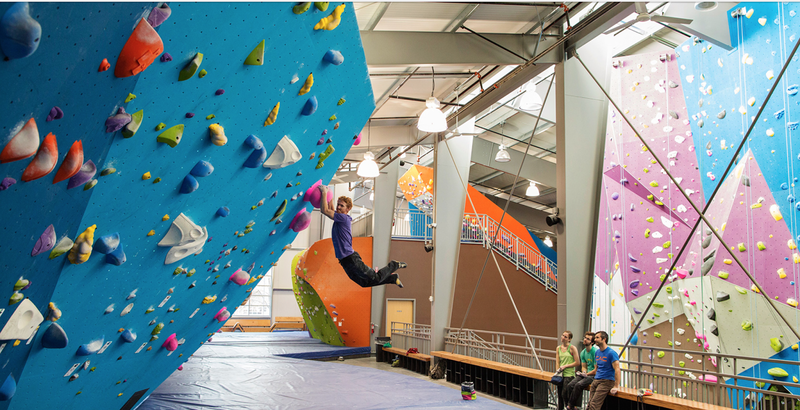 To top-up the fun, the gym organized a speed climbing event for the first time. Olcay, the manager of the gym, and his team worked many hours to offer a great variety of problems, and lodged the entire team for the three nights we spend in Juneau. Hats off Olcay! The overall male winner of the competition was Maxime Parker, coach and former athlete of the Yukon Youth Team. The second place was and athletes from Juneau. The Yukon was well represented with the third place of Tomas Tokic. Tomas had the title for the Yukon bouldering championship held in December 2015 at FH Collins. Julian Beairsto and Pelly VincenT-Braun took 5th and 6th place. Luke Bakica did excellent for his first Indoor competition with a 7th place. On the female side we had Fionnuala Marion (Whitehorse) with a 7th place and Julia Frasher (Whitehorse) with a 9th place. Sya Berkman (Whitehorse) took the 11th position in the female open. Erin Meade, Casysha Fleischman and Kelsey Stockert, all from Juneau, took first, second and third respectively. 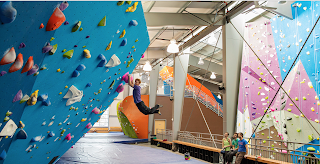 Next year we are hoping to invite the junior and adult athletes from Juneau to compete in an event in one of the bouldering gym we have in Whitehorse (Porter Creek or the Yukon College). The new gym at Porter Creek has allowed a fast improvement in technique and strength for our local athlete due to the steep angles of the wall, which allows to set-up harder problems. At this point we are running out of space for our athletes, as the wall can support about 20 athletes training in the same time. I am hoping to get a larger wall to increase the participation of the youth in the sport. Next year all our 20 athletes from FH are staying in the territory, and more athletes from PC will join the team for sure. It will be tight and we will have to be creative for training. Congratulation to all athletes that participated to the annual Juneau comp event 2016! Here is a topo of climbs at the Acropolis climbing venue (a.k.a Vinyl Village)which should help many climb to get around the area. I have focused on sport routes and one trad route on this topo. Dave Benton have also done a fair amount of work in there, and will have the trad information published when next edition of Ryan Agar guide book is published. With climbs 15 to 20 meters high, 5.7 to 5.12 in grade and ten minutes walk from your car, this site is a gem for all climbers. A helmet will save your brain in there, as this is an fairly new developed area, and rocks can be loose. Park in front of the fenced Pump house on Winze Place in Copper Ridge. Walk right (West) on the main trail past the pump house and follow the main trail for about 100m. Once you see a house with a large brown deck way up on your right, you should see a fairly small trail turning left along the cliff band. Follow this small trail, that goes down the cliff and turn on the left trail at the bottom of the cliff. Follow this trail up and down again, and you will get to the climbing area. Now you are confused aren’t you? If so, go back in there with a friend that knows how to get there! 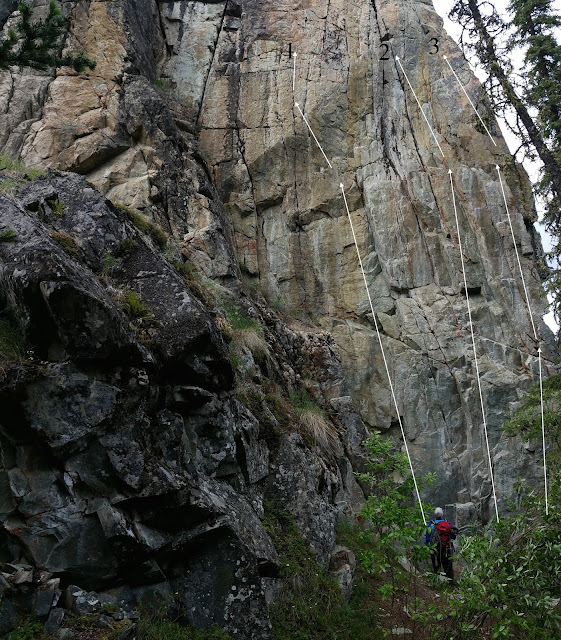 Most climb are accessible from the top to set-up top ropes, but some are exposed sketchy on the South face. There is a trail on both sides to get access to the top. The right side is much easier than the exposed left access. This climb is bolted and starts on the left end side of the face. The crux move is on the overhanging section of the climb, which is fairly crimpy. The climb was bolted by (FA) Sean MacFarlland, and named after his deceased dog, which was following him on all his adventures. This crack can be well protected, and is located between Taiya and Swamptart. It is overhanging all the way to the top, you will get you a real good pump. Once past the ledge the fun starts. It is hard to say, who would have done the FA of this crack, but Dave Benton is the only one I know that have cleaned it on trad. A five stars climb. Swamptart is located on the far left side of the face. This climb rating is a little high considering some climbers, however it will give you a different forearm pump with many of the large holds. Don’t celebrate victory too quickly; it has a sting in the tail. It was bolted by (FA) Alain Dallaire and Sean MacFarlland. 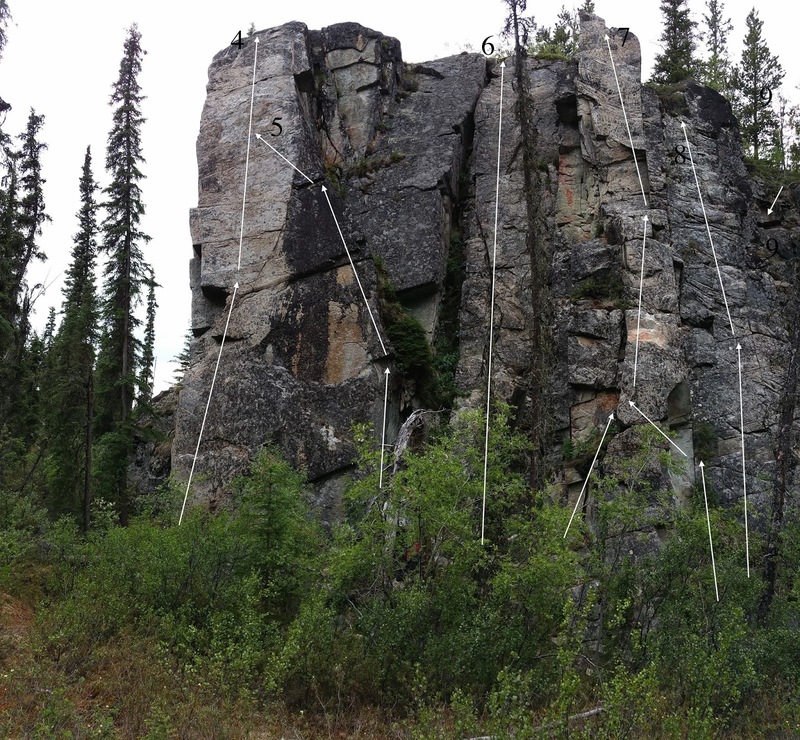 The best overhanging sport trad I know around Whitehorse! This is the first climb on the left side of the North Face. Be ready for a bouldery barn door start move to the first bolt. The rest is crimpy with tiny ledges for your feet, and consistent at the grade. The last bolt will require good footwork. Ryan Agar created the top rope climb of this route and most of the cleaning. With his permission (FA) Alain Dallaire and Sean MacFarlland bolted the line a few years back. A great climb for the rating. Bolted and FA by Alain Dallaire. This route is a variation of Sting in the tail for now. It starts on the arête to the right of Sting in the tail and uses the last two bolts of the climb, as well as the top anchors. Nice climb which requires a fair amount of balanced moves. The first climb on the right side was (FA) cleaned and bolted by Dave Benton. This must be one of the best lines close to Whitehorse for learning leading. Well bolted, it has a series of nice foot ledges all the way up. A must for the beginner leader. This climb was (FA) by Dave Benton and bolted and cleaned by Alain Dallaire and Dave Benton. There is two starts and the far right one is a little tricky. The dirt adds a little spice to the climb on the start to the right. The access to the top rope is fairly easy from the top. The first bolt is high but necessary, and the move for the second bolt is tricky. The rest of the climb is fairly consistent at the grade. Dave Benton (FA) cleaned and bolted this route. Bolted and FA Alain Dallaire. Shane Dooley and Matt Shenk helped to create the route. The route is a meter away from little goat around the corner on the other face. You can start this route on the first, second or third bolts as the hill goes up with the route. The crux of the climb will be the last two bolts. A nice two fingers crack will appear and a few awkward moves will get you to the top. This route is fairly awkward to top rope, unless you use directional. Top rope anchors are easy to reach from the top of the climb. Still some questionable rocks on this climb, keep your belayer in a safe spot.